EDIT: It looks like the developer no longer owns to domain to these links. Luckily, you can still access the tool through itch.io: https://pnjeffries.itch.io/spartan-procjam-edition/purchase Yes, it’s still free (just click on “No thanks, take me to the downloads”), but you can also contribute some money if you wish. Your game, all your content (i.e. Art, Music, Sound, etc) must be created in [length of jam]. If you’re working solo on your game (and aren’t miraculously skilled at types of art), you may have explored the realm of content generators. If you explored the realm of content generators and haven’t found SPARTAN yet, you’ve been missing out. I don’t want to overstate its usefulness, so I’ll begin by describing its scope. SPARTAN (Small Pixel ART ANimator) is a free program that allows for creation and animation of small-sized pixel art sprites and textures. It has a pixel art toolset, so you CAN make your art by hand right inside the program and animate it as well. That’s not what I find to be the most useful feature of the program, though. What I really like is the procedural art toolset built in. SPARTAN was expanded for the Procedural Generation Jam 2014 to include a versatile functionality set that allows you to quickly create tile-able pixely textures. Let me stress the key points there – random and tile-able. Randomness can be an indie developer’s best friend, so the textures generated by this tool will save you a whole lot of time and make up for a whole lot of lack-of-skill in the art department. And if you’ve experimented with making any type of game textures before, you’ve probably run into tiling problems. There are many ways to deal with them, of course, but here’s a program that just takes care of that for you. You can see from the screenshot the type of textures you might be creating. These would work for 2d platformers, top-down adventures, even 3d games. Without SPARTAN, Her Majesty’s Apathy Bomb would have never come to be. Like many versatile tools, it takes some learning. Of the first screenshot I showed you, I could probably only make half of those images without really taking some time to figure out what the more complex features of the program do. Luckily, the program’s creator (Paul Jeffries of Vitruality) has some nice tutorials on how to get started with it (number 1 and number 2). So, go on! Get texturing! I don’t know how it took me so long to find this. I played the original Spelunky for hours and hours, marveling at its seamless world generation that felt simultaneously familiar and perpetually fresh. I gleaned quite a lot about procedural generation by simply PLAYING the original game – the randomization felt so elegant and simple, I felt like it was something I could almost do in my own games. Or at least wrap my head around. I found this Spelunky Level generator the other day (it works in Chrome only! ), and spent quite a while discovering that I was right and wrong about my initial conceptions about how the randomization works. On the one hand, it is fairly simple, at least on the surface. And it is very elegant, no doubts about that. On the other hand, though, I was very wrong about exactly HOW the randomization works. It was pretty clear to me that there were these chunks that fit together seamlessly, and there was a limited amount of them and they could randomize their contents to some degree. It was the first few steps that I had missed. The simple numbered drunkard’s walk to populate the initial grid from the top-down … brilliant. It ensures that there will always be a direct path to the exit (in case you run out of bombs), but the variety of zero-numbered side rooms makes it just difficult enough for the casual player to not necessarily (or consciously, at least) see the descending pattern and find the exit with no missteps. But it’s the randomization of the blocks inside the templates that really pushes my buttons. On this page (part two of the simulation), just keep hitting the 3 key and watch the white-highlighted squares – the ‘probabilistic tiles.’ Their quantity in any given chunk makes for near endless variation, yet not so much that you still can’t recognize the chunk type. This is the feature that really clinches the procedural generation for me. I’m used to enemies moving around in games like Mario, so variety of enemy placement is nice but not novel. These probabilistic tiles variation ensures that you’re going to be making new jumps, judging new distances, and accidentally falling to your death in new ways in every single run-through. In any case, hopefully it’ll give you some inspiration if you’re thinking about using procgen in your game! Give it a try! Gifs like this one (with a static background) end up with TINY filesizes! I might have been somewhat late in the game to start using GifCam, but this post is for people who still think that it’s easier to, I dunno, record your screen with FRAPS [shudder] or even OpenBroadcaster and then use Premiere or something to export a snippet of that video as a gif. That’s what I was doing for a while, and gosh if I didn’t wonder how anyone had the patience to gif-ify their gamedev. File sizes were as huge as the quality was bad. How did people embed those 20 second long gifs on Twitter when it has a 3mb image size limit?! Well, I’ll tell you how. Or at least one way. I started by using good ol’ GfyCat, but even that didn’t play as nicely with Twitter as I would’ve liked. So, after a few false starts, I started using GifCam … And it is awesome. It’s very easy to get the resolution to exactly what you need, and it’s not too difficult to trim your recording down to size. You then simply save it and see if the file size is what you need. If it’s not, trim it some more and re-save. It’s relatively painless. This gif, having only two colors, is even smaller than the Space Foxes one! It’s not 100% perfect, though. You might run into issues with transparency – which is one of the ways GifCam keeps the file size down. If you encounter big green swatches in your gifs, you need to change the transparency color. Resolutions can get messed up if you continue recording after changing the window size without clearing all the footage you have so far. It could also be a lot easier to edit the footage you capture – a timeline with frame preview would be amazing. These are minor foibles, though, and the creator is fairly active and periodically releases new versions with new features. So, check it out, and you’ll likely like it. You can find it here. The download link is sandwiched between the bottom of the post and the top of the comments, so it can be a little tricky to locate. It’s right above the Wreck-It Ralph gif. If you have suggestions for other programs that do what GifCam does (but better), please let me know in the comments! Appealing-looking controller prompts add a lot to a game. They make you just WANT to press the buttons, you know? A while back, I stumbled upon this UI asset pack by Xelu. Since then, I’ve basically sworn off using UI prompts that I’ve made – no more sloppy, almost-square W keys or not-quite-the-right-green XBOX controller A buttons for me, no sir! This pack has got quite a bit of variety, too. I usually don’t stray far from the XBOX and keyboard/mouse sets in this collection, but if you’re supporting PS controllers or designing for WII U or A touchscreen, you’re covered as well. And, to top it off, it’s free-to-use – however you like. You don’t even have to credit Xelu, but I feel a healthy amount of gratitude. And I think you might, too. Be aware, however, that the actual IMAGES of the controllers in the preview of the pack depict trademarks, so steer clear of using the full controller images – just the buttons! Here are a few times I’ve used these prompts! They’re not textured right now, but if you’ve used Blender before, some quick UV mapping will fix that. I personally recommend setting the edges to sharp and throwing an ambient occlusion map on ’em. With a little vertex tweaking, you could end up with some awesome low-poly models like those used in Aer (check the screenshot below for inspiration). Game sound effects are hard. As someone who’s tried recording sound effects with a crappy microphone (including making laser blast noises with my mouth), there came a time when I sat down at my computer and just started at, puzzling over how I could convince it to make the sounds I wanted for my game. It wasn’t until several years later that I found bfxr. This is a marvelous little free tool made by increpare, based on an older program made for a Ludum Dare called SFXR. You can, of course, tweak that aforementioned plethora of settings to get the sounds you be exactly what you want. I’ve been using bfxr on and off for several years, and most of them are still a mystery to me, but that’s okay. You’ll want to try out the mutate button a good amount, and watch how the sliders change. Then, slide a slider at a time and see what happens. Be aware, though: the sliders are very sensitive and it’s easy to get your sound irretrievably unrecognizable. Make sure to save sounds you like before messing with them. The end result of all this, of course, is some pretty nifty lo-fi ‘bleep-bloop’ sound effects to use in your game. I don’t necessarily recommend using this if you’re making a fully 3D RPG or realistic FPS, but you still night be able to wrangle some button click sounds out of it even if you are. However you use it, the takeaway here is that bfxr empowers you to make sounds yourself. They’re entirely unique, and an excellent starting place for budding sound designers or game developers who don’t know their way around a microphone (like me) or who can’t find the exact clips they need on a site like freesound.org or freesfx.co.uk. I’m not particularly musically inclined. That being said, I love music and games that use music well. 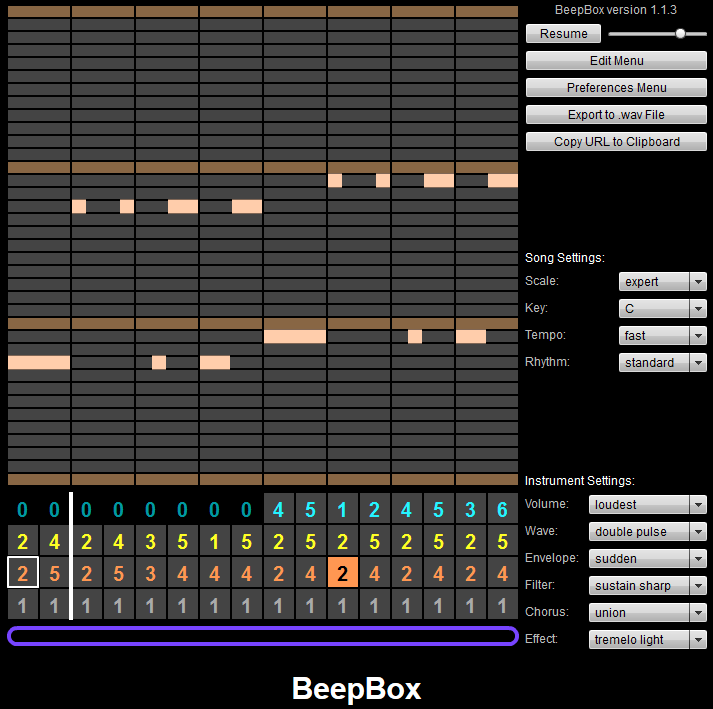 I’ve experimented with numerous online music composition programs (particularly ones that do a lot of the work for you), and I want to draw you attention today to BeepBox. It’s one of the most robust chiptune music composition programs you’ll find that also manages to stay user-friendly and easily approachable. You can, like me, just start clicking stuff and, as if by magic, it’ll probably sound good. Keep layering and adding to it and you’ll have a pretty cool song pretty quickly. If you actually have musical talent, you can change the key, rhythm, scale, as well as various instrument settings, and make a pretty awesome, complex song that sounds like it’s straight out of one of the great chiptune albums of yore (like the VVVVVV soundtrack, for example). All of the song data is stored in the URL, so all you have to do to save it is bookmark the page once your song is created. PRETTY sweet, to say nothing of the remarkably easy .wav export button. Beyond that, it has built in Twitter functionality. Even if you don’t use Twitter, you can take a look at the feed of people sharing their songs, and, if you’re not feeling all that confident about your own creations, you can reach out to someone who is and ask for permission to use their songs. I’ve done this in the past and people have been very willing to share their work (provided I wasn’t making money off of them, which I wasn’t). So, give it a try. Share your songs with me on Twitter or in the comments! Here’s one I whipped up in a few minutes to get you started. Quick shout-out to John Nesky for making such an awesome piece of software! Every now and then, I won’t be feeling very creative. Try as I might, any game development work I try to do gets nowhere. At times like this, I try to find some inspiration. Oftentimes, this means playing an hour or so of a great game (recently it’s been FRACT OSC). But sometimes, all it takes is seeing some art that gives me a new idea. Now, coming up with a new idea isn’t always a good thing, especially if it means your other projects fall by the wayside. But if I see something that gives me a cool game idea, and I spend an hour or so prototyping it out, then I’m back in the groove. And then (hopefully! ), I can get back to what I actually want to work on. Some art that’s gotten me thinking lately are these two random sprite generators: this one by Boris van Schooten (of Tomatic Games) and this one by Carl Olsson (AKA Uninhabitant). They’re both really fun for different reasons, but here’s a quick outline of the differences. The sprite generator by Tomatic Games allows generation of tiles or 10×10 sprites (or 12×12, including black outline ). These sprites also often include several frames of animation, which is super awesome. 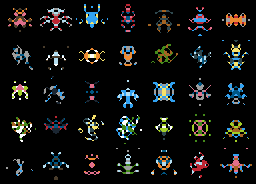 The sprite generator by Uninhabitant is far more robust – you can control the size of the sprites generated, the grid size to generate them in, the color palette, and tons of randomization tweaks that I barely understand. You can really get them to look just the way you want. The downside, of course, is they don’t animate themselves. Take a look at both of them, and just see if they don’t, for lack of a less-gross phrase, get your creative juices flowing. And, heck, you might even get a solid game idea out of one or both of them. Or perhaps a character design concept. Who knows? Do you know of any other random image generators? I’d love to see them! Share the love! Let me know in the comments or on Twitter! 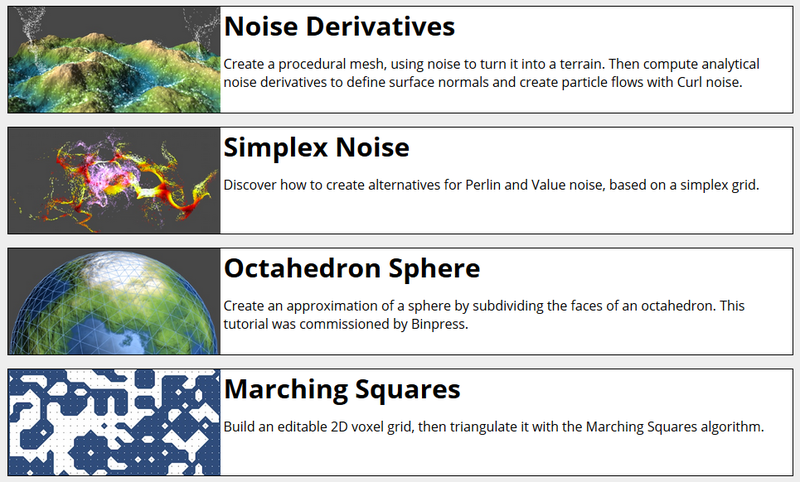 Just a few of the really cool tutorials. I mean, just LOOK at those thumbnails! … Do I seem a little too excited about these thumbnails? There are some really interesting tutorials here, and what’s more, they’re really fun. I can look at the thumbnails for each one and imagine an entire game based on the mechanic they teach. They’re meticulous and methodical, so be prepared to spend a few hours on each one, but, dang will you be glad you did. They get into fairly complex topics, but don’t let that scare you off. I worked my way through Noise and am halfway through Noise Derivatives, and, to be honest, I understood about half of what I was doing. Maybe a little less! But, as I said, they’re excellently notated and include project files for multiple steps throughout the process, which is very useful if you can’t get something to work quite right. And besides, if you’re trying to improve your coding skills, what better way to do so than pushing yourself out of your comfort zone and ending up with, say, a procedurally generated ocean surface to boot? If you’ve still not had enough, take a look at NumberFlow as well. Also by Jasper Flick, this is a free (for non-commercial use) Unity plug-in that does some awesome procedurally generated textures for you in real-time. How cool is that? !